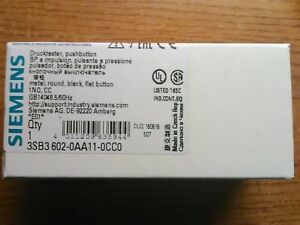 Details about SIEMENS 3SBS 602-0AA11-0CC0 BLACK FLAT PB WITH 1 N.O. CONTACT, GREAT PRICE!! SIEMENS 3SBS 602-0AA11-0CC0 BLACK FLAT PB WITH 1 N.O. CONTACT, GREAT PRICE!! Immediate payment of US $8.95 is required. Please note that I describe the items to the best of my ability. Do not buy unless this is the item you need. I do not offer refunds unless I have not listed it properly or there was a mistake, Thank you.